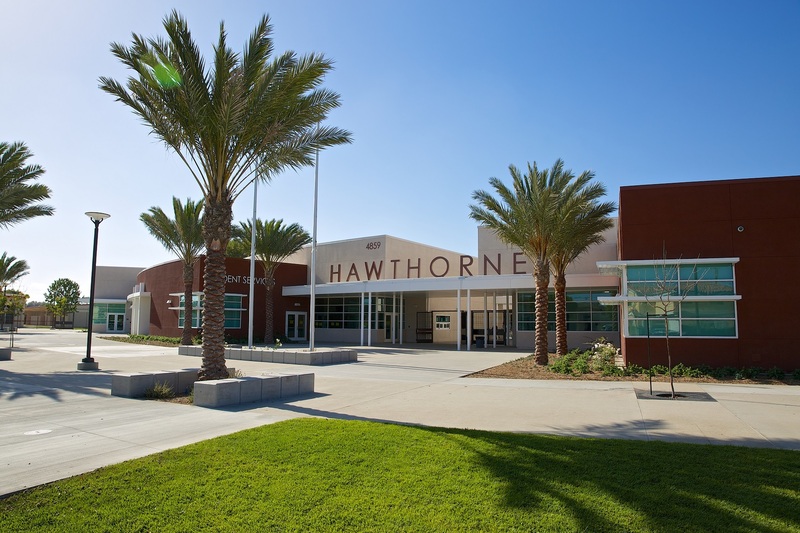 On September 8, 1959, 1,900 students trudged through the doors of Hawthorne High, including seventeen-year-old seniors Al Jardine and Brian Wilson, and Brian’s fourteen-year-old brother Dennis, one of 500 entering freshmen of the Class of ’63. As much as they hated to return to school, there was some good news. The school day would be thirty minutes shorter this year. It still began sharply at 8:30 a.m. and each of the seven periods still lasted 53 minutes, but a half-hour was shaved from the two lunch periods. The new schedule gave cafeteria workers more time to restock food and prepare for the second lunch period. The not-so-good news was getting accustomed to the new bell system signaling when to change classes as students had seven minutes to scurry to their next class. The lunch periods began at 11:23 a.m. and 12:23 p.m., and each lasted thirty-eight minutes. If you didn’t pack your lunch, you spent a great deal of that precious time waiting in line. 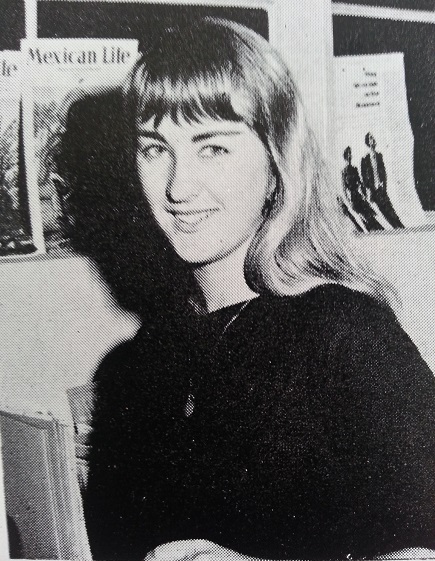 Senior Jean Robertson returned to Hawthorne High after spending her summer in Istanbul as part of the American Field Services Program described as “an international exchange program designed to promote the understanding of the social, political, and cultural differences among the nations of the world.” The program arranged for American students to study abroad and students from foreign countries to attend school in the United States. The AFS club at Hawthorne High had about two dozen members and sponsored two Backwards Dance (including the April Fools Dance), a pancake breakfast, and sold U.S. Savings Bonds during AFS week in early October to raise money to send a student overseas. Robertson was one of ninety American students to fly from New York via Newfoundland, Ireland, and Greece, en route to Istanbul where their plane was met by hundreds of Turkish families greeting them at the airport. Upon returning, Robertson told her classmates, “Women [in Turkey] have much more freedom [now] than they did, but most teenage girls are not allowed to date or in some cases speak to boys outside the family. Turkey is a man’s world and the women obey their men to the letter without any back talk. The Turks are warm and friendly and the boys are very handsome.” In her new position as managing editor of the weekly Cougar, Robertson wrote a column periodically about her experience in Istanbul. Helping to broaden the student’s international perspective, Hawthorn High began this year offering Russian as a foreign language and hired Kathryn Zalowski away from Fairfax High School to teach that course and one on social studies. Zalowski was one of twenty-six new teachers to join Hawthorne High that year and she quickly became one of its most popular. The blonde, blue-eyed, former part-time model was young, single, and very attractive. She was Ukranian and grew up speaking Russian and studying it in college. A native of Detroit, she now lived with two girlfriends in Hollywood and was working on her PhD in political science and Russian at USC. She enjoyed ballet, folk dancing, singing, and studying the cultures of countries in which she had traveled. On July 26, 1959, the Los Angeles Times reported the local school board discussed the course curriculum and that Zalowski would stress conversational Russian. For hormonally charged teenage boys, she spurred a whole new interest in all things Russian. Students recall her getting into her convertible after school and driving off with her long hair streaming behind her. More than fifty years later, she is still recalled fondly on the school’s alumni website. 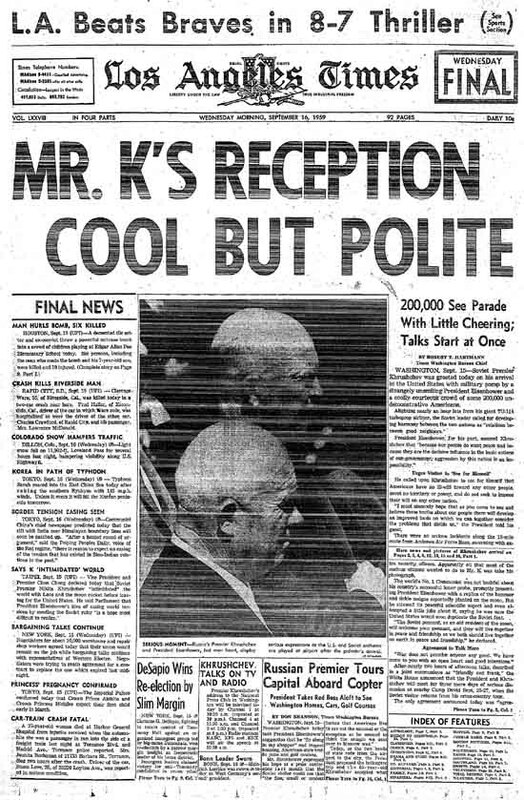 On Tuesday, September 15, barely two weeks into the semester, Zalowski had a unique opportunity to teach her Russian students a lesson in cold war diplomacy when Soviet Premier Nikita Khrushchev made a historic visit to the United States. It was the first time a Soviet leader had set foot on American soil. Khrushchev was sixty-five years old and had been in power about five years when President Eisenhower invited him to Camp David. Eisenhower thought it would be for just a few days, but Khrushchev surprised him by asking if he could first travel around the United States for “ten to fifteen days” before meeting. Khrushchev, his wife, Nina Petrovna, and their adult children, visited the U.S. for thirteen days. After arriving in Washington, D.C., and getting settled at Blair House, Khrushchev met briefly with President Eisenhower and Vice President Nixon. Khrushcehv expressed indignation to Eisenhower over an interview printed in the morning papers in which he claimed Nixon used “impermissible expressions” about the Soviet Union and socialism. Eisenhower handled the remark diplomatically and went on to offer the use of Air Force One, a Boeing 707 at the time, for Khrushchev’s visit of the country. Khrushchev spent a few days in our nation’s capital and New York City, where he got stuck in an elevator on the 30th floor of the Waldorf Astoria and remarked “capitalist malfunction.” Accompanied by United Nations Ambassador Henry Cabot Lodge, he then flew to LA on Saturday, September 18. Although a trip to Disneyland had been planned, the State Department urged Ambassador Lodge to dissuade Khrushchev because of security concerns. Khrushev was disappointed and flashed a bit of his famous temper. He angrily asked, “Then what must I do? Commit suicide? Is there an epidemic of cholera there? Or have gangsters taken hold of the place that can destroy me?” In his memoir, he wrote he believed anti-Soviet Union demonstrations were being planned at Disneyland and that the U.S. government wanted to shield him from any unpleasantness. That evening, LA Mayor Norris Poulson hosted an elegant dinner for Khrushchev at the Ambassador Hotel. During Poulson’s remarks, Khrushchev was offended at what he perceived to be “uncomplimentary remarks, especially regarding the position taken by the USSR in world politics.” Khrushchev decided not to let it pass and asked Poulson for the opportunity to respond. He said, “Mr. Mayor, I am a guest of the president and I have come here at his invitation. But I did not ask to be your guest, and I will not permit any disparagement, any humiliation, and especially any insulting statements against Soviet policies, against our country—the great Soviet Union—and against our people. If my visit here as a representative of the USSR does not suit you, our plane is sitting at the airport in Washington. I can always summon it to come right here and fly back to the Soviet Union from here.” The audience was stunned. Khrushchev left LA the following day and traveled north by train to a whistle stop in San Luis Obispo. On the train, Lodge apologized for Poulson’s remarks. Lodge had read an early draft and had edited them heavily, but Poulson retained a few comments that offended the testy Soviet premier. The decision to travel by train was a calculated one. The State Department wanted Khrushchev to see Vandenberg Air Force Base where Atlas missiles aimed at his country were clearly visible from the train. Officials reasoned that if Khrushchev saw our missiles, then President Eisenhower could ask to see Soviet missiles on a visit being planned for 1960. 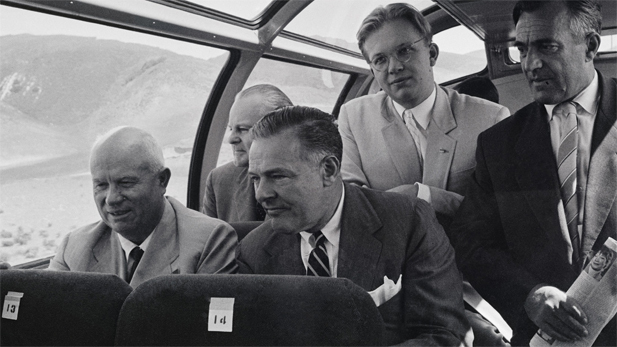 Khrushchev shrewdly turned his head the other way as the train passed Vandenberg and refused to look at the missiles. He would not be beholden to Ike to show him Soviet missiles. The train continued north to San Francisco where Khrushechev visited an American supermarket, addressed a group of longshoremen, and met with Walter Reuther, the head of the AFL-CIO and president of the United Auto Workers union. As a young man, Reuther was sympathetic to the Soviet Union. After being let go from the Ford Motor Company in 1933, he traveled to the Soviet Union and worked at an auto factory in Gorky where he became disillusioned with socialism. 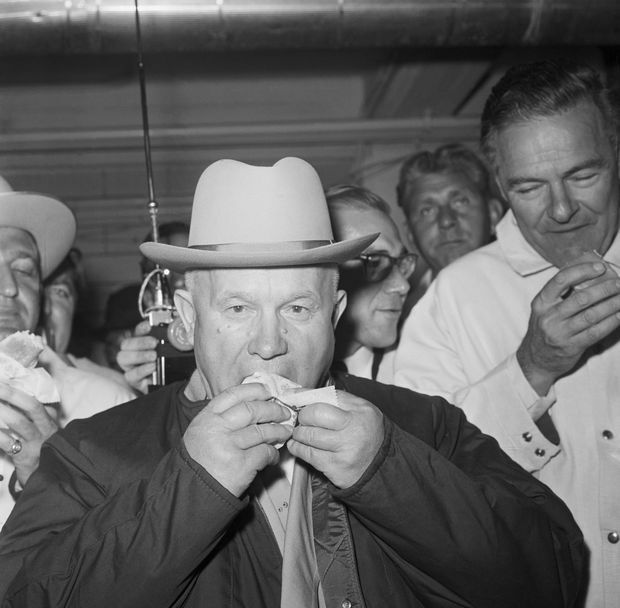 After San Francisco, Khrushchev traveled to Des Moines, Iowa, where he ate his first American hot dog during a tour of a meat packing plant. Although the unionized plant workers were on strike and refused to meet with Khrushchev, the plant owner seized the opportunity to promote his business. He had Khrushchev and Lodge eat hot dogs for the gaggle of American and Soviet journalists covering the trip. Krushchev also toured Iowa State University in Ames, Iowa, and visited Roswell Garst’s large farming operation. Khrushchev and Garst first met October 17, 1955, at the government dacha of Livadia, not far from Yalta in the Crimea. Garst was one of the owners of Garst & Thomas, a subsidiary of the Pioneer Company which grew hybrid varieties of corn. He visited the Soviet Union to observe Soviet agricultural practices. Khrushchev reportedly was impressed with American agricultural education and farming techniques. From Iowa, it was on to Pittsburgh where striking steel workers refused to meet with him so the delegation drove around and toured the city by car. Khrushchev later commented the women were dressed in “shorts, blue jeans, and very lightweight dresses. Our women wear more expensive dresses, with darker colors, that cover their bodies more.” He then returned to Washington, D.C., for his meeting with President Eisenhower at Camp David in Maryland. The two leaders discussed Berlin and when Vice President Richard Nixon escorted him to Andrews Air Force Base for his flight to Moscow, Khrushchev reportedly left feeling detente was possible with this American administration. The night before Khrushchev landed in LA, most Hawthorne students had a decidedly less global event on their minds. The traditional Kick-Off Dance was held in the boys’ gymnasium Friday, September 18, from 8:00 to 11:00 p.m. The dress code was dressy cottons for girls, and slacks and sport coats for boys. It was the first social event of the new school year and was designed to get the student body pumped up for the first football game of the season the following week. In an oddly comforting way, it is somewhat reassuring to know high school humor has not changed much in more than fifty years. To hear a discussion of the Khrushchev visit to the U.S., listen to NPR’s All Things Considered as broadcast by WNYC 93.9 FM: Khrushchev visit (Panel: Leonard Lopoate, NPR; Robert Stone, Director of film Cold War Roadshow; William Taubman, Political Science Professor, Amherst College). Halberstam, Robert. The Fifties. New York: Villard Books, 1993. Krushchev, Nikita Sergeevich. Sergei Krushchev, George Shriver, Stephen Shenfield. Memoirs of Nikita Krushchev, Volume 3: Statesmen (1953-1964), The Pennsylvania University, University Park, PA, 2007.